The REPO-TRIAL project consists of the following 5 work packages (WPs), of which the first 3 are interdependent and represent the scientific part of the project. Work package 4 is responsible for pharmaceutical and medical exploitation of successfully repurposed drugs, work package 5 for proper dissemination of the project’s results to the public and the overall management of the project. See below for a more detailed description of each work package. Work package 1 provides the in silico basis for the validation and proof of concept of the subsequent work packages (WP 2 and WP 3). The first goal is to update the “human diseasome”. This means to identify common denominators of symptomatically different diseases (e.g. heart failure and depression), based on shared molecular, mechanistic and genetic abnormalities. The second goal is to create a corresponding “drugome”, meaning using computer software to identify mechanistically related, but currently unexploited new targets for drugs that are already on the market, but were originally used for different medical purposes. WP1 researchers are collaborating with several outstanding systems biology groups, and are able to use their platforms and tools for big data meta-analyses. Work package 2 will then use specific and goal-oriented animal studies to experimentally validate at least 10 of the yet-to-be-exploited repurposed drug targets that were identified in silico in WP 1. The results of WP 2 will feed back into WP 1, for example to refine certain gene cluster configurations. WP 2 constitutes a necessary requirement and a regulatory filter before considering clinical studies in WP 3. To access and utilize the largest possible amount of already existing data (not only data published in peer-reviewed journals), and to reduce the number of animal experiments to a minimum, WP 2 researchers will perform a rigorous and systematic online literature search and consult the database http://pre-clinicaltrials.org. Based on at least 3 of most promising preclinical trials from WP 2, WP 3 investigators will then initiate clinical trials on actual patients with a cerebro-cardiovascular disease phenotype, including detailed outcome assessment. The development of many new drugs often comes to an abrupt end in phase II of clinical trials. REPO-TRIAL applies a strategy that is anticipated to enhance the likelihood of phase III drug development and drug approval, in part because repurposed drugs provide a much better “effect versus risk (side effects etc. )” ratio. All clinical trials will be planned and conducted along strict ethical guidelines and underlie a tight quality control programme. The Clinical Trials Centre Maastricht will be used for warehousing, documentation and monitoring of all clinical data, which will eventually feed back into the large-scale “diseasome” and “drugome” data bases of WP 1. The primary goal of WP 4 is to make REPO-TRIAL known to the scientific community and the public, to disseminate the results to scientists in the academic, healthcare and pharmaceutical sectors, and to foster the interaction between the scientists and the public. WP 4 members will furthermore identify and valorise intellectual property rights that were generated within the REPO-TRIAL project, and initiate the first steps to perform a full phase III clinical trial, and/or to promote business development, the foundation of a spin-out company, and licensing of one or more repurposed drugs. 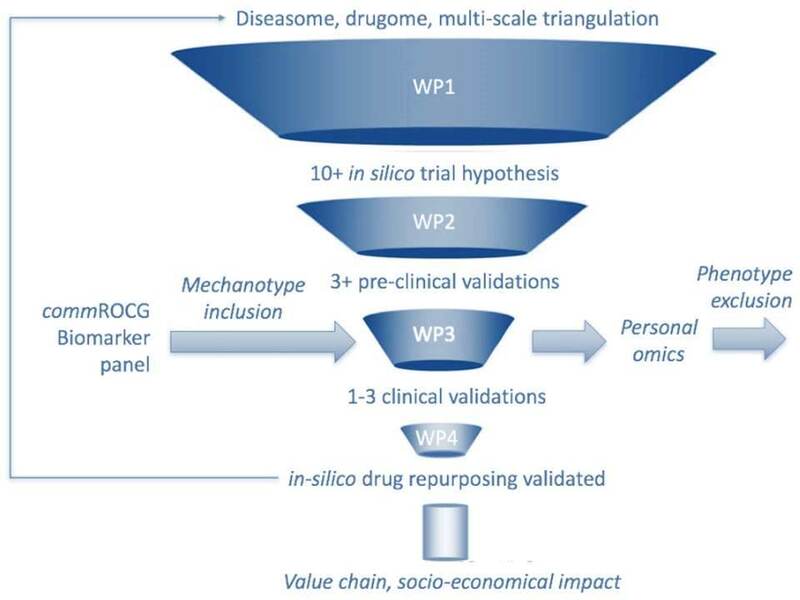 Most importantly, WP 4 will develop interdisciplinary and specialist training modules to broaden the general knowledge around drug repurposing and in silico drug design, and to share specific insights gained from WPs 1 to 3. This management WP is led by the project coordinator, Prof. Dr. Harald Schmidt from Universiteit Maastricht (UM), and is supported by concentris. Together with the project coordinator, concentris provided significant help and guidance during the project-proposal phase, and ensures the successful progress of the project after funding was granted. Experienced management is necessary to achieve the general objectives of larger projects, to reach and complete work package-specific deliverables and milestones in time, and to make sure that the consortium’s contractual duties towards the European Union / European Commission are carried out properly. concentris also organizes biannual steering committee (SC) and general assembly (GA) meetings, and develops the project’s website, a flyers/folder, posters, presentations and other dissemination activities for REPO-TRIAL in order to convey the relatively complex scientific background, methodology and results of REPO-TRIAL to the public, to patients, and to other interested non-experts.